There are times I see something and know exactly what to do with it. In fact, that's normal for me. I find it hard not to bring home a new project from a thrift store, yard sale, craft store, friends house or wherever else inspiration hits me. So when I wind up with a project that stumps me, I have to confess it's annoying. It's as if it was teases me. 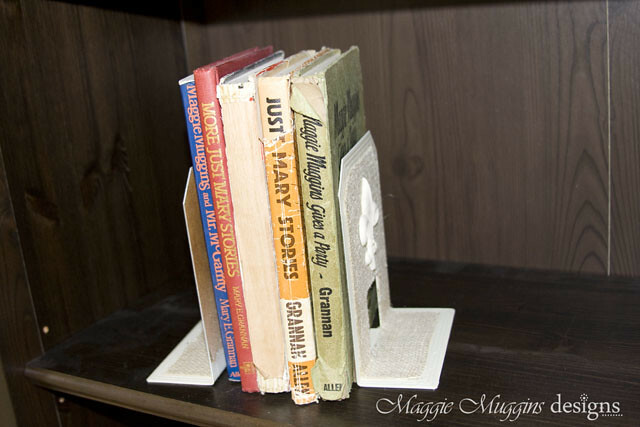 That is what happened to me with these book ends. They were my Husband's Mother's and we were given them a few years back. 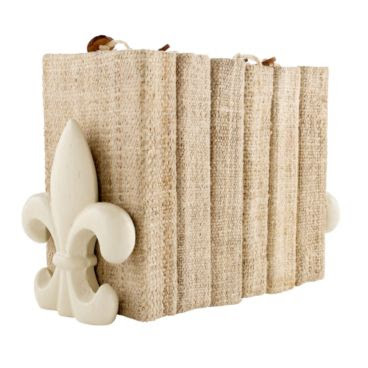 I liked the style, especially the Fleur-de-lis, but it needed a fresh new look. The possibilities were endless, but I honestly didn't know what I wanted to do with these. Not a clue! 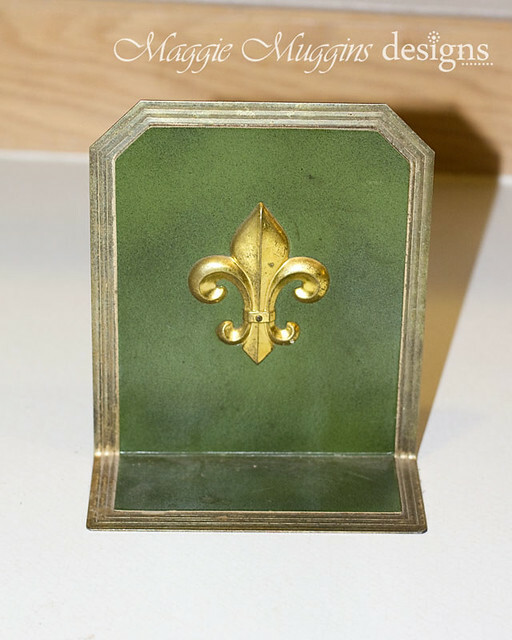 I pulled the book-ends apart, removed the beautiful Fleur-de-lis and got busy spray painting. 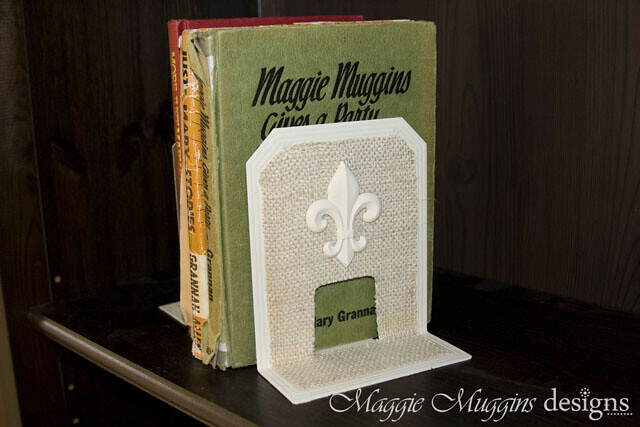 I applicatied of Burlap using Mod-podge. (Is it OK if I confess, I'm not huge on burlap - no way am I making a scratchy burlap pillow. Sorry! This was my first time using it.) I painted the Fleur-de-lis' and glued it back on. Can you believe it? These are so adorable now! 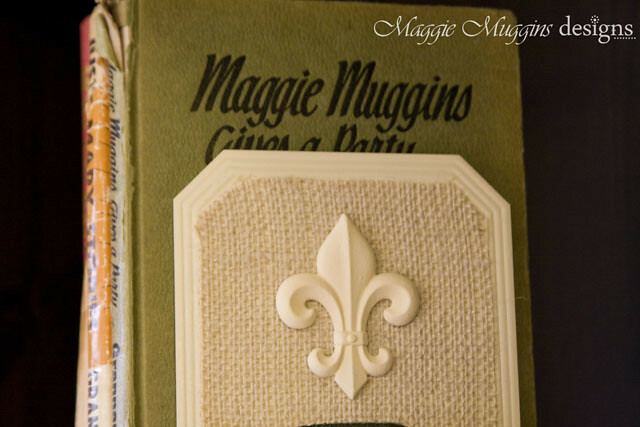 Here they are holding my little collection of Maggie Muggins books, collected in my childhood. I got an old Pizzaria sign for free that sat around for a while, waiting for the perfect inspiration. I almost turned it into a beach sign, then almost turned it into some sign for the nursery. 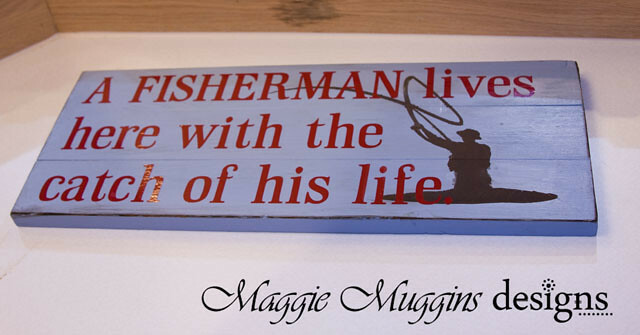 But for a long time I have wanted to make a sign for my Sister-in-law with a Fisherman quote that I'd seen. You see, my brother loves to fish. So when I first read the quote "A Fisherman lives here with the catch of his life." I thought of them. I stored the quote away in my mind and waited for inspiration. 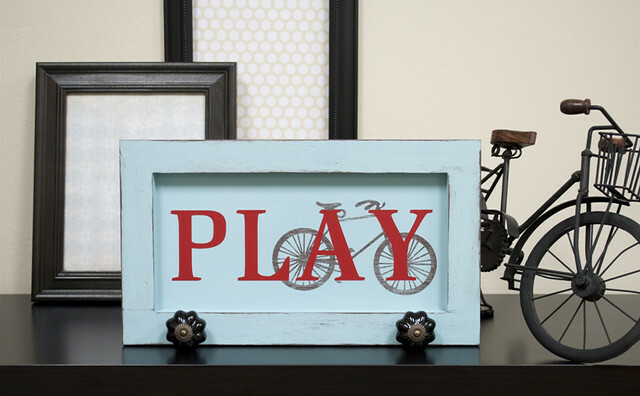 When I saw this sign on the Silhouette blog I finally knew exactly what I wanted to do. I loved the colors on their sign. I love that blog! So out came my sign. I slapped on a coat of my favorite Benjamin Moore paint. A blue sample I bought for $1 a while back. I love the color. After it was dry I was shocked. For the FIRST time ever one coat was not enough! The red "Pizzaria" was showing through and was still VERY visivle. 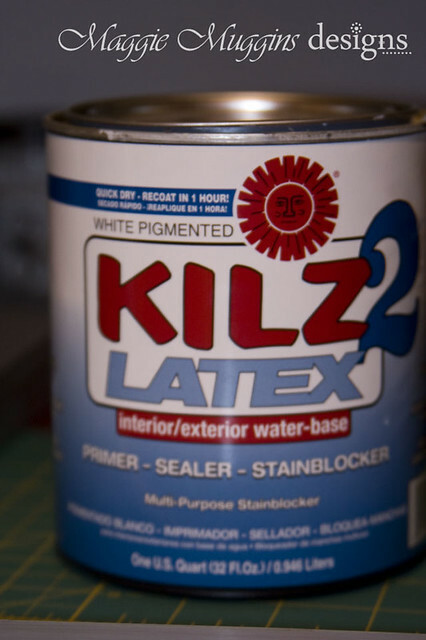 I knew it must be the kind of paint that just never gets covered, so instead of trying more coats, I pulled out my Kilz. (Primer, Sealer and Stainblocker!) Those of you who have used it know what a lifesaver it can be! I threw on a coat, repainted, and got down to business. 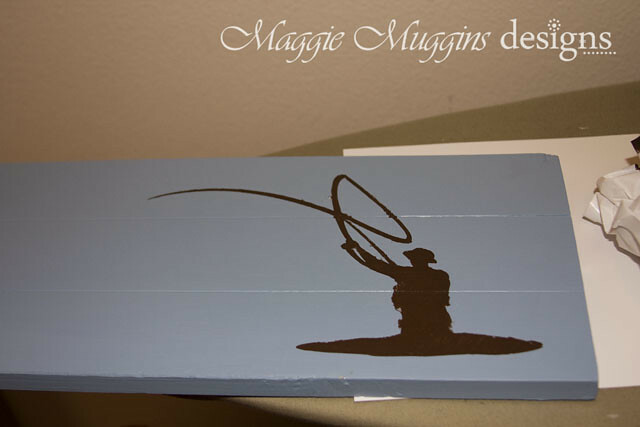 Using my Silhouette I cut a fisherman image out of Freezer Paper to use as a stencil. I carefully ironed the outline and inner pieces onto the board. Then I painted that image brown, let it dry, and touched it up once before removing the paper. If you try this you need to be careful not to touch the paint and to avoid too much bubbling around the edges otherwise you will have some paint bleed. At this point I sanded the fisherman and the whole board on the top a little, then sanded the edges down. I did a little touch up with blue paint around the edges of the fisherman. 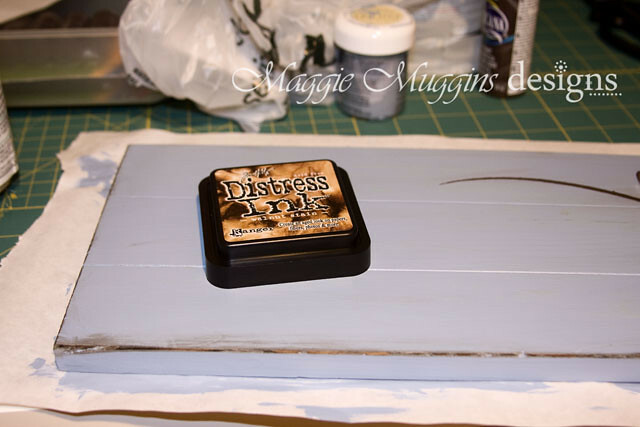 Then I used my Distress Ink (Walnut Stain) and wiped it on the edges and smudged a little randomly on the front too. Then I wiped the front down so it was light, but not the edges. Lastly, I cut the words out in a red vinyl on my Silhouette. I measured the board and the space needed between the lines so that I could cut it all out exactly as it should be spaced. Linking this up to CSI Project for the Reduce, Reuse, Recycle Challenge. A new reader asked me how to edit the text on the Labels for the Spice Jars. Thanks for the question Leslie! 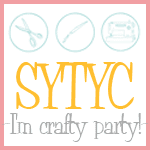 It really isn't as difficult as it may seem, but I know many of you are new to Silhouette Studio. Seeing as this will come in handy for many files you download, I thought I'd share a quick tutorial for you. 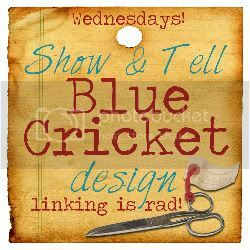 Note: Once you have changed the text it may not be centered on the image anymore. So I'm going to show you how to do that too! I'm going to show you using the Spice Labels. The real trick to this is that the text is part of a grouped object and must be "Ungrouped"
2. Click on one of the circles to select it. Adjustment lines will show around the object that is selected. 3. Go to the Object Menu and select Ungroup. Or hit Ctrl+U. This will split the object into 3 pieces. 2 circles and 1 text object. 4. Click on the white part (to deselect all of the objects) or go to Edit->Deselect All. 5. 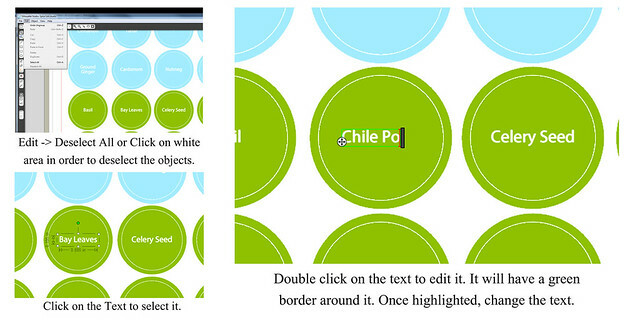 Click on the text in the circle you ungrouped to select it. Then double click on it to edit it. A green border will show around it. 6. Change the text as desired. Lastly, click on the white background to Deselect the text. Now you've changed your text! But it might not be centered anymore. Follow the directions below to center it. 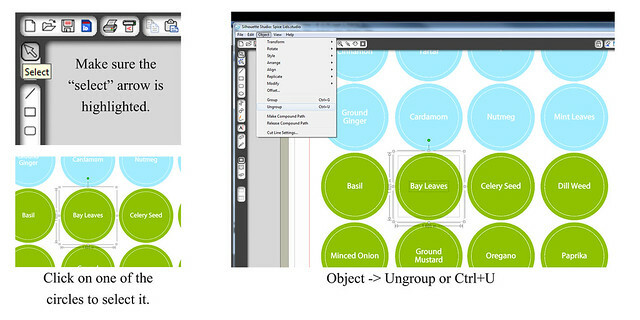 There are several options for aligning a group of objects to each other. With the spice labels, I want each object centered on the one below it. 2. Go to Object->Align->Align Center-Middle (which is the same as choosing Align Center, then Align Middle). 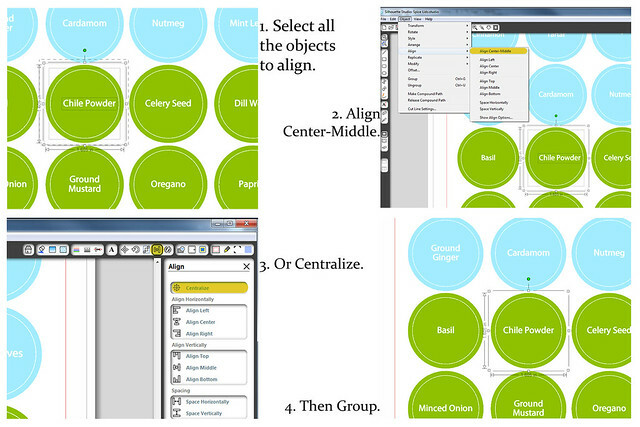 You can do the same in the Align Options Window (on the right side) by selecting Centralize. I hope that helps you start finding your way around a little better in Silhouette Studio. With a little bit of practice, you'll be able to get the hang of it. I don't usually post about Chicken. Actually, I don't think that I ever have. But I just had to share this awesome deal. Last year I learned about Zaycon Foods. I bought my first box of Fresh, Delicious, 100% Natural Chicken. Boneless, Skinless Chicken Breasts, to be exact. At $1.59/lb the 40lb box was absolutely worth it! If you live in Washington State they are delivering Chicken to different locations next weekend. If you are in Oregon, Idaho, near Pheonix, Dallas, or Oklahoma City, then you should sign up for an account and join their email list. Trust me - it's great chicken. Of course, there is one detail that I need to share: This is raw fresh, chicken. 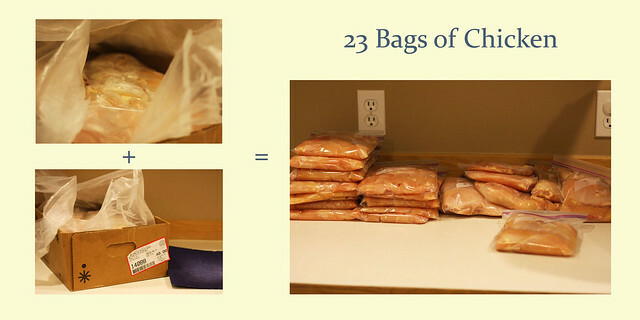 It is packed in a large 40lb bag and you will have to do at least a little cutting as they are still butterflies (the two breasts from each chicken are still joined) and bagging to freeze it. But for the savings it was definitely worth it to me! Head on over and check out Zaycon Foods. Note: I am referring you and I do benefit if you sign up using my referral name: ZF7004. This post is in no way meant for me to earn money though. 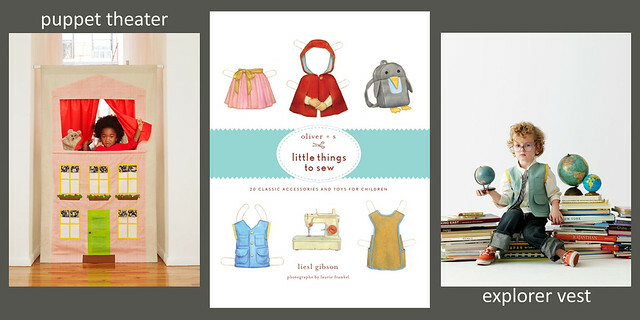 I just ordered the brand new Oliver + S Book Little Things to Sew from Amazon.com . It's $15.62 which is 43% off the price of $27.50 at Oliver + S. I can't wait to get my hands on this and try out some of their adorable patterns. I'm so glad it's prime eligible and I'll be getting it on Saturday! I especially love that penguin back-pack! I have a new Silhouette project in the works! I can't wait to share it with you, and I've got more Silhouette Tutorials planned. I have neglected to share this with you for too long. But that is because I wanted to show you how to make them too - and tutorials take time! Want to make this yourself? Well, let's get started on the tutorial. As with all my tutorial, these are for Personal Use Only. 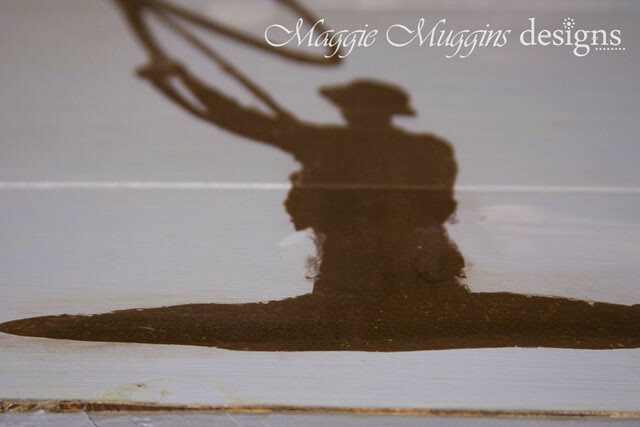 Please share photos of your projects made from my ideas in my Flickr Pool Maggie Muggins Designs In Action. I'd love to feature them! Please let me know if there are any mix-ups, confusions or if you have any questions! 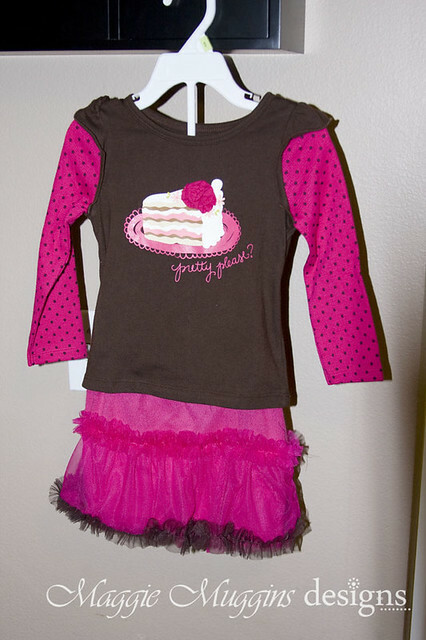 I purchased the Non-Fray Chiffon at the link above. It's a really good price! It is 54" wide and plenty for the 18M and 2T sizes that I made. 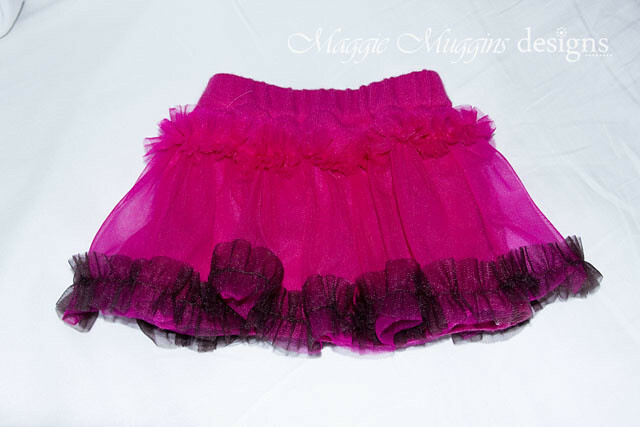 For skirts for larger sizes you may want to purchase wider Chiffon. I found some available here . If possible - prewash the sweater in a normal wash. That will prevent very much shrinking later and save the little girls Mom on worries. I have two boys, and no girls, so I didn't have any skirts to trace to create a pattern. Instead I pulled out a pair of pants in the size that the skirts needed to be. (I used cotton knit pants.) 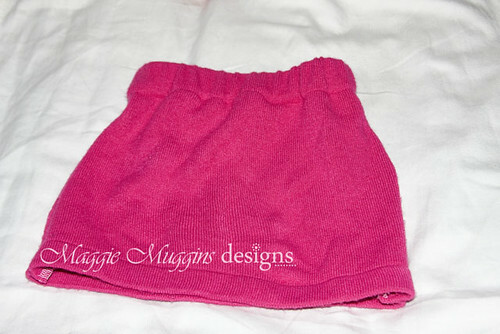 So if you don't already have a skirt pattern either trace a girls skirt or boys pants. I use freezer paper for my patterns. 1. 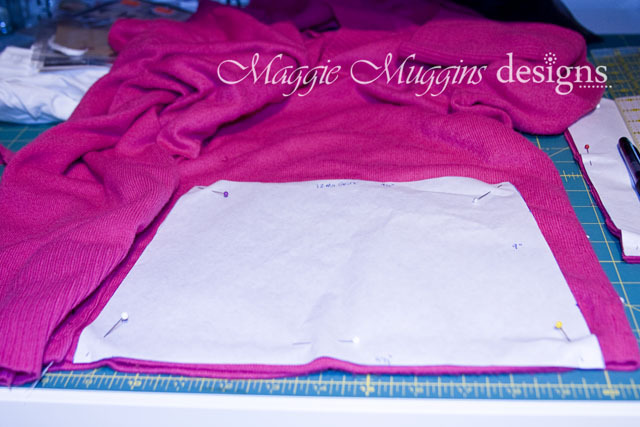 Place the pants/skirt on paper and trace the outside down to about mid knee. Pull the pants/skirt off. 2. 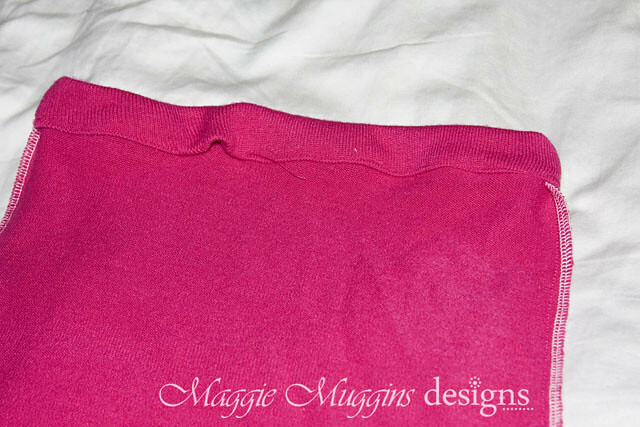 Add a 1/2" to the sides for seam allowance and about another inch at the waist for the elastic. 3. Fold the pattern in half and make sure both sides are symmetrical and the top and bottom are straight and perpendicular to each other. 1. 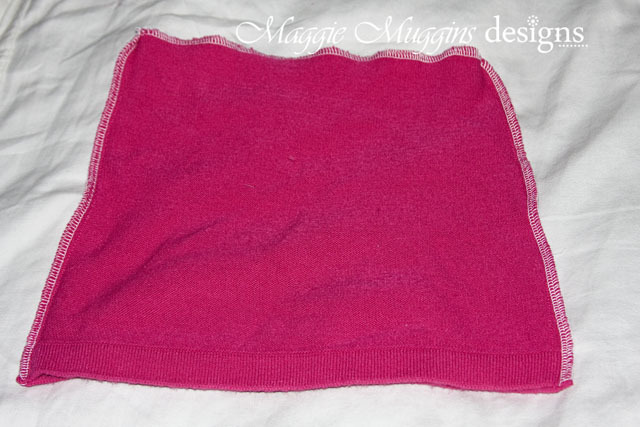 Flatten the sweater out and line up the hem on the back and front evenly. 2. 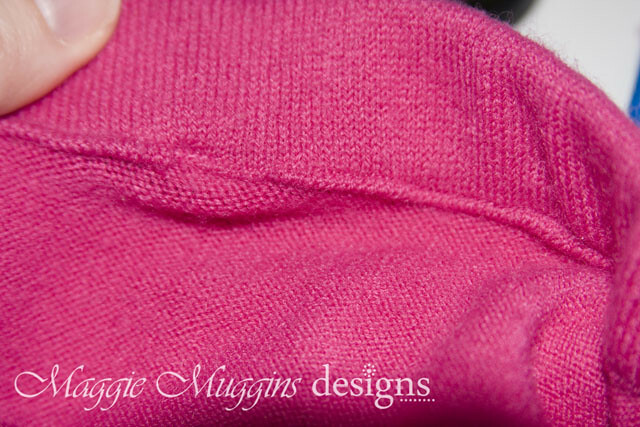 Line the bottom of the skirt pattern up to the hem of the sweater. 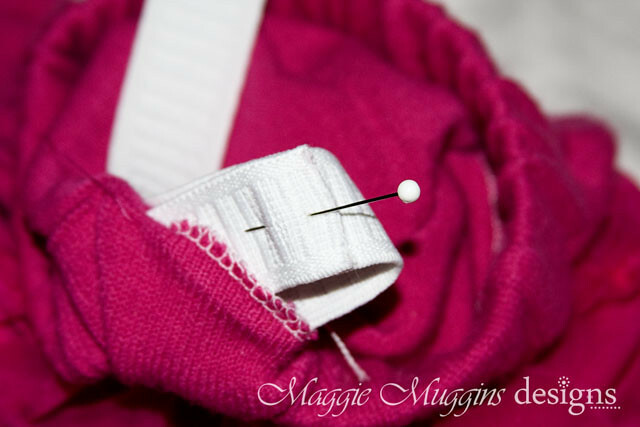 This will give you a perfectly hemmed skirt already. Pin and cut through both layers for the front and back of the skirt. 1. Pin the sides of the skirt right sides together. Sew the seams using 1/2" seam allowance. 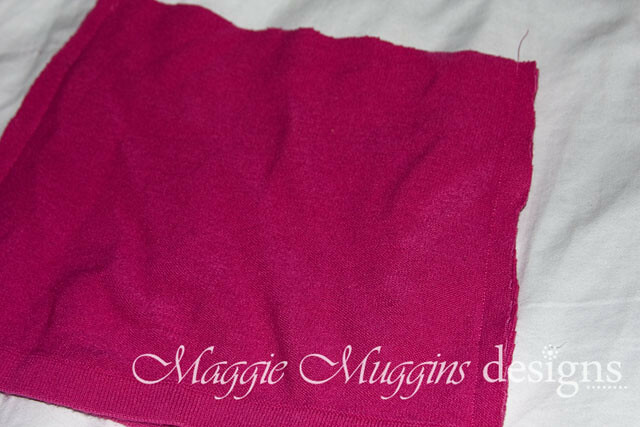 Finish the seams (zig-zag stitch or serge). 2. Finish the seam on the waist band (remember sweaters are knit material and if something gets pulled it could all come unraveled). Fold towards wrong side 1/4" and pin. Fold again towards inside 3/4" and pin again. Sew 1/8" seam near edge of fold. Leave a 2" opening in the back for feeding the elastic through. 3. Cut the elastic to waist length for waist. I used the pants I made the pattern from to help estimate length. Both skirts fit so I'm thinking it was a good judge. 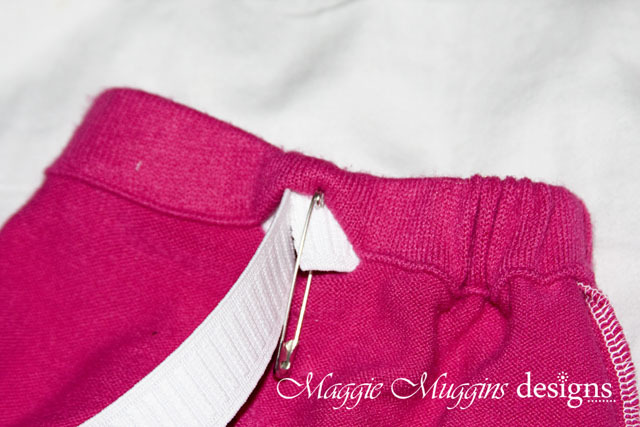 Feed the elastic through the opening using a safety pin. Overlap the elastic at least 1/2" pin the elastic together as it needs to lay inside the band (make sure it's not twisted at all). 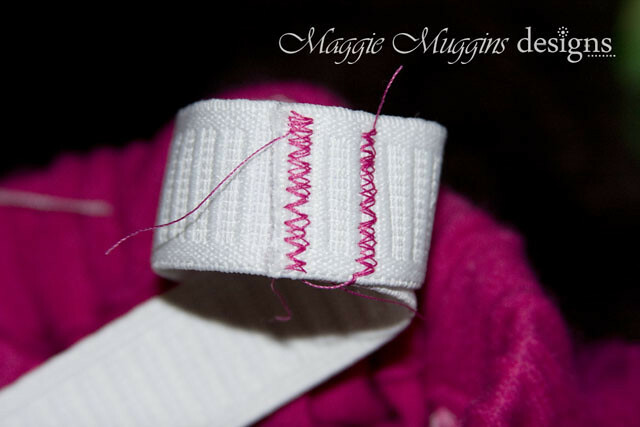 Use a zig-zag stitch to sew up and down on the elastic on both edges of the overlap. Trim and pull the elastic completely into the waist band. 4. 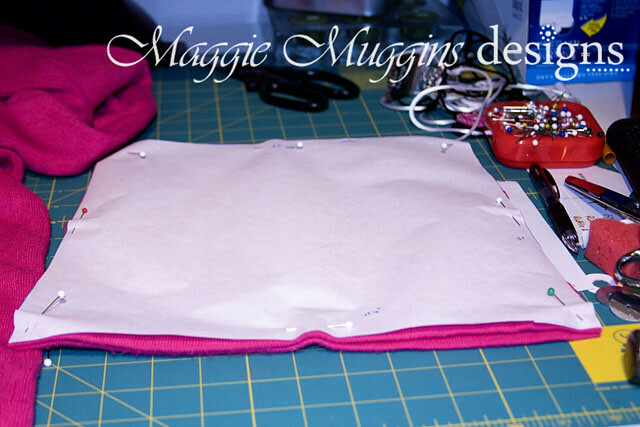 Insert a tag (to mark the back) if desired and sew the opening closed. I didn't bother with a tag. The pattern front and back were identical so it didn't matter. Now you have a complete skirt. You could stop here, add pockets, ribbon, flowers, appliqué or anything you think would be fun. 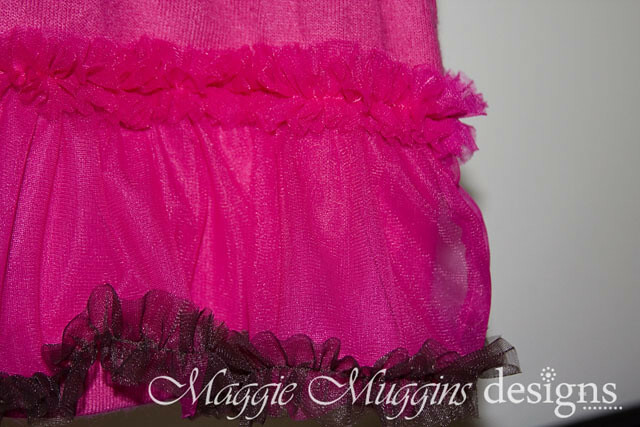 Or continue and add the chiffon ruffle. 5. Fold the large chiffon piece in half, wrong side together (if you can tell) and sew down the side. Turn right side out. Before moving on mark the middle of the fabric with a pin or washable marker (fold in half with the seam on one side and mark the other side). 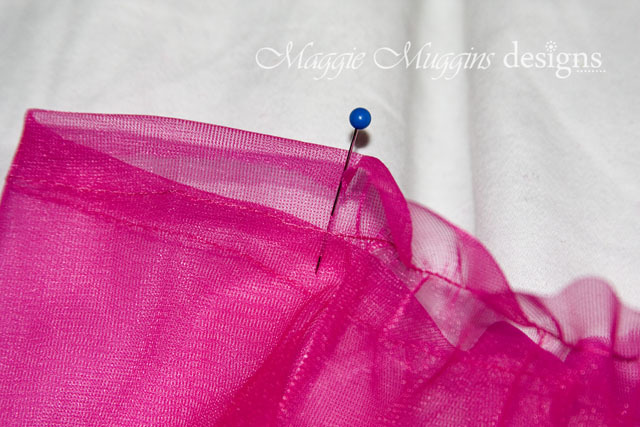 This will help you line up the sides when sewing the chiffon on the skirt. 6. 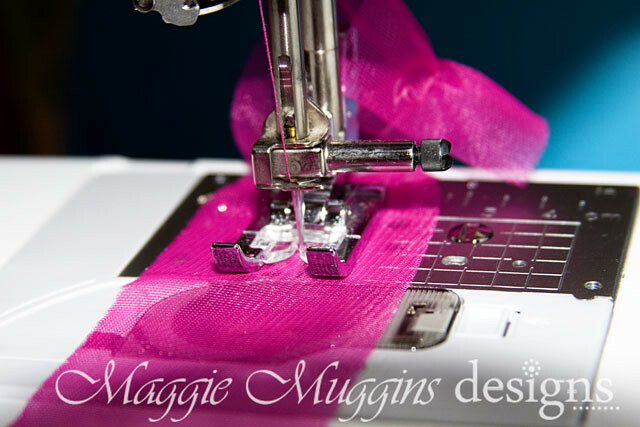 Set your machine to a basting stitch (larger stitch width) and turn up the tension. 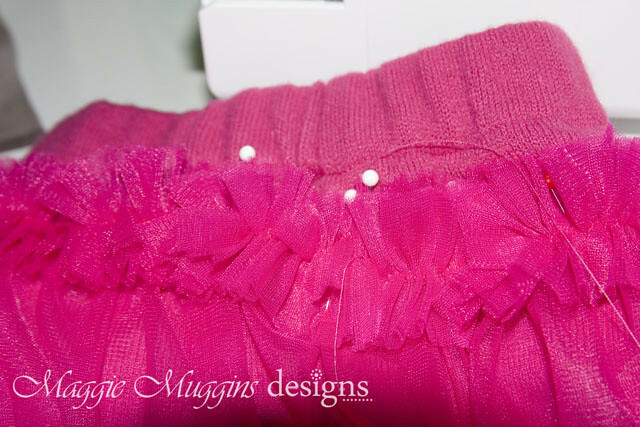 The higher tension will make one thread pull tighter and gather the ruffles more. Don't back stitch at the beginning or end so you can gather the ruffle more if needed, or un-gather. 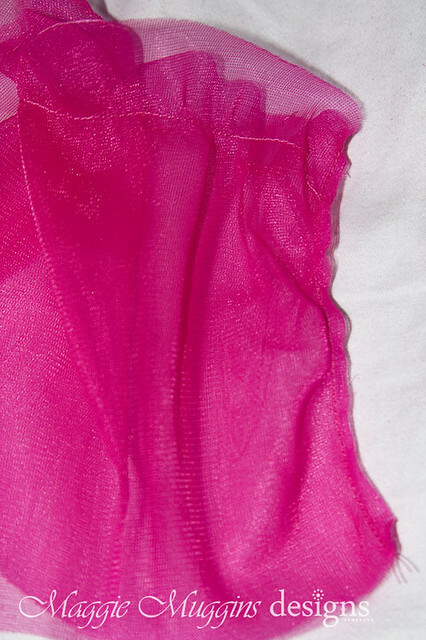 Sew across the top of the chiffon fabric at 1/2" or 3/4" (depending on the width of the smaller chiffon strips you cut, use half of that measurement). 7. 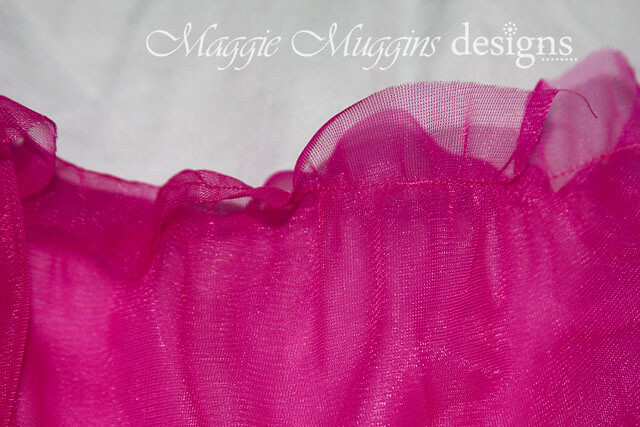 Line up the bottom of the chiffon with the bottom of the skirt, one side seam with the chiffon side seam and one side seam with the pin mark. 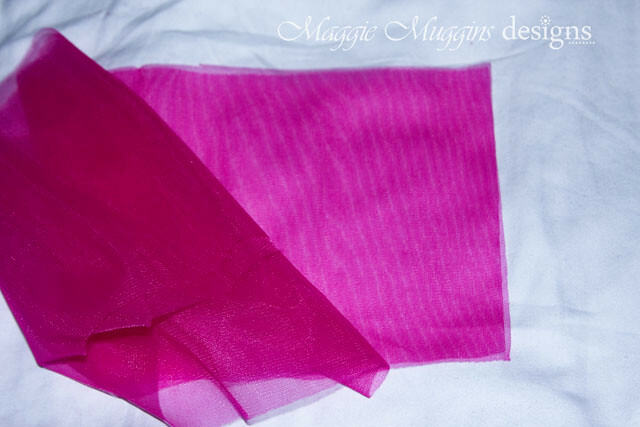 This will help you evenly distribute the chiffon layer around the skirt. Gather more if necessary and pin to the skirt. Turn your machine tension and stitch width back to normal. Sew along the baste stitch. Once completed, remove the baste stitch if possible. That will prevent a lot of excess threads later on. 8. 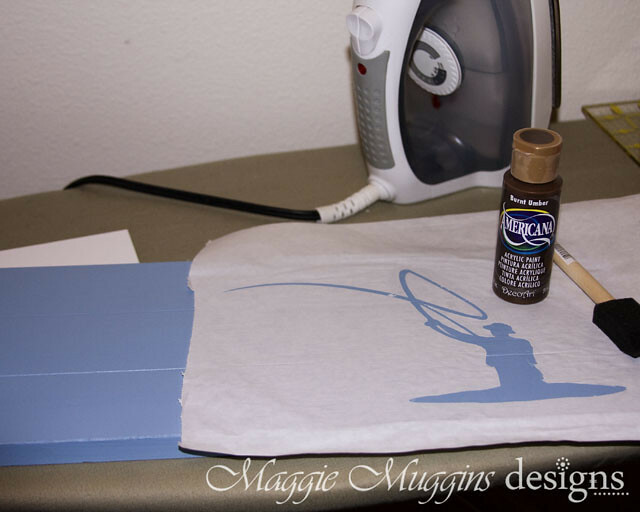 Take the top color chiffon strip and repeat step 6 on your machine, mark the half-way point and baste down the center of the strip. Do the same for the bottom strip. You can choose where to put the ruffles. I added one to the top and one to the bottom, but Bloomingdale's version is really cute too. 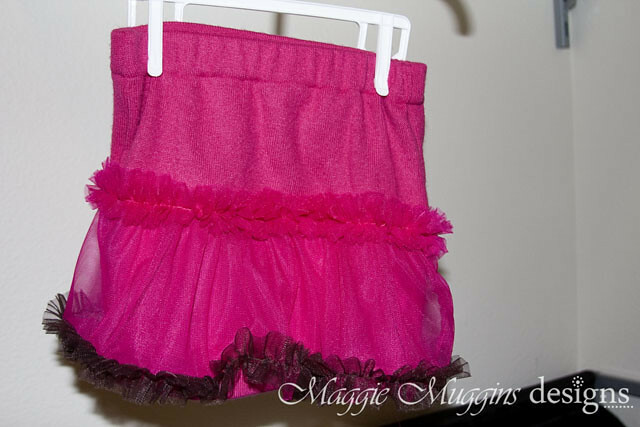 Pin the ruffles at the sides where you marked and then gather as needed and pin around the rest of the skirt. On the end, just overlap them a small amount, don't worry about sewing it together. That's it! Your skirt is complete. 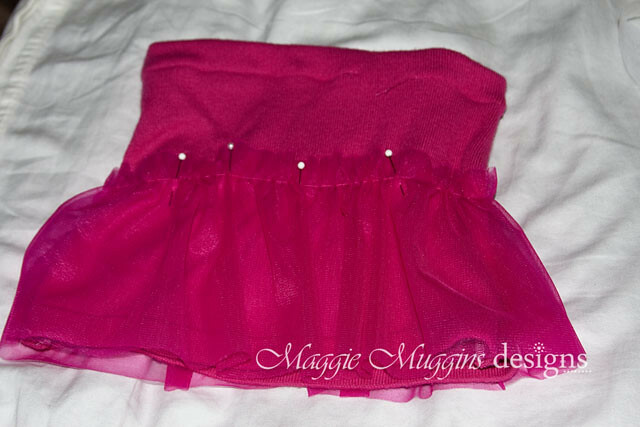 Trim any loose threads, fluff the chiffon where needed and put it on your little girl. Either that or gift it away. 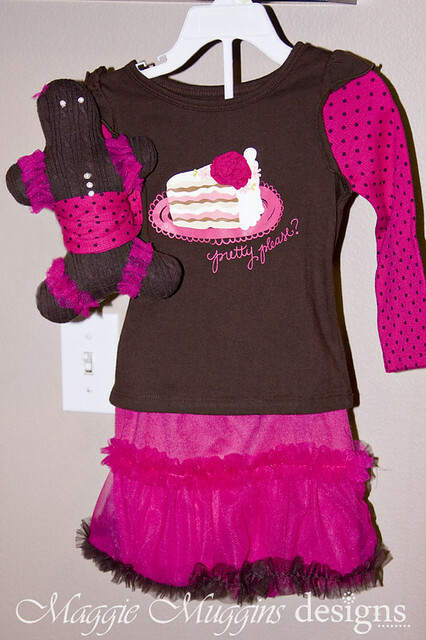 Here is the entire outfit complete with their matching Gingerbread Dolls that the girls got for Christmas! Happy Valentines + Free Printables! Cutest Fabric of the Year!